Burial He was buried in St. Mary's Cemetery, Section M, St. Mary's, Perth County, Ontario, Canada. 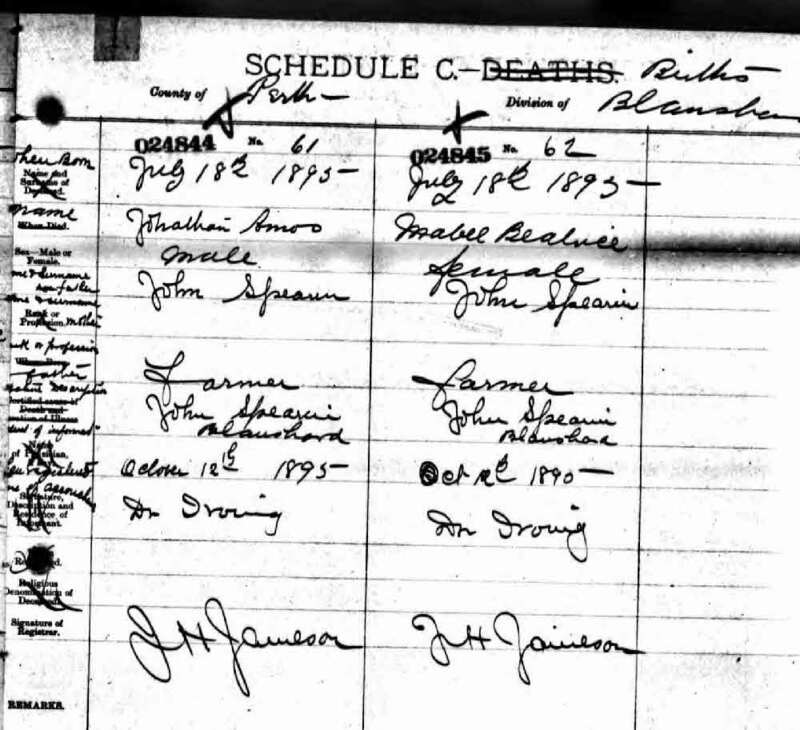 Marriage* Jonathan Amos Spearin married Catherine Shier, daughter of Jonathan Shier and Ann Ryan, on 15 February 1893 in Woodham, Perth County, Ontario, Canada; Married on same day as her sister Martha. 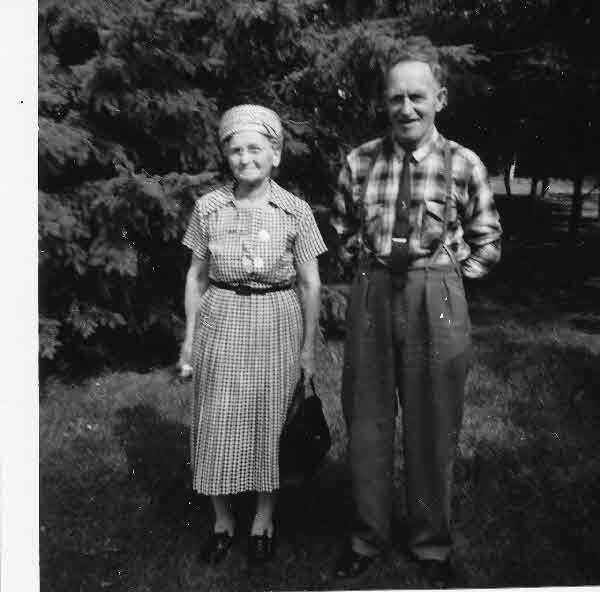 Birth* Jonathan Amos Spearin was born on 18 July 1895 in Blanshard Twp., Perth County, Ontario, Canada. 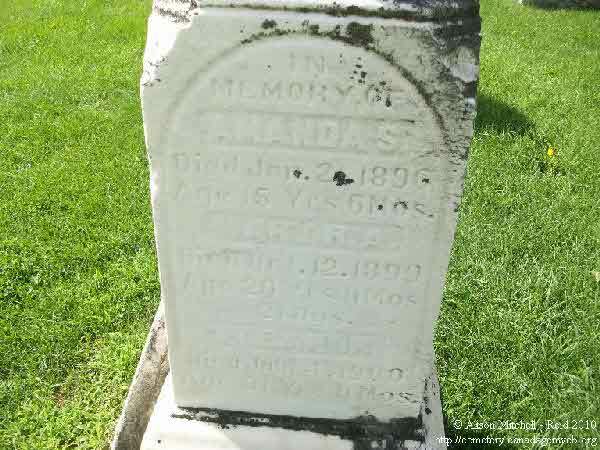 Death* Jonathan Amos Spearin died on 2 July 1896 in Blanshard Twp., Perth County, Ontario, Canada. 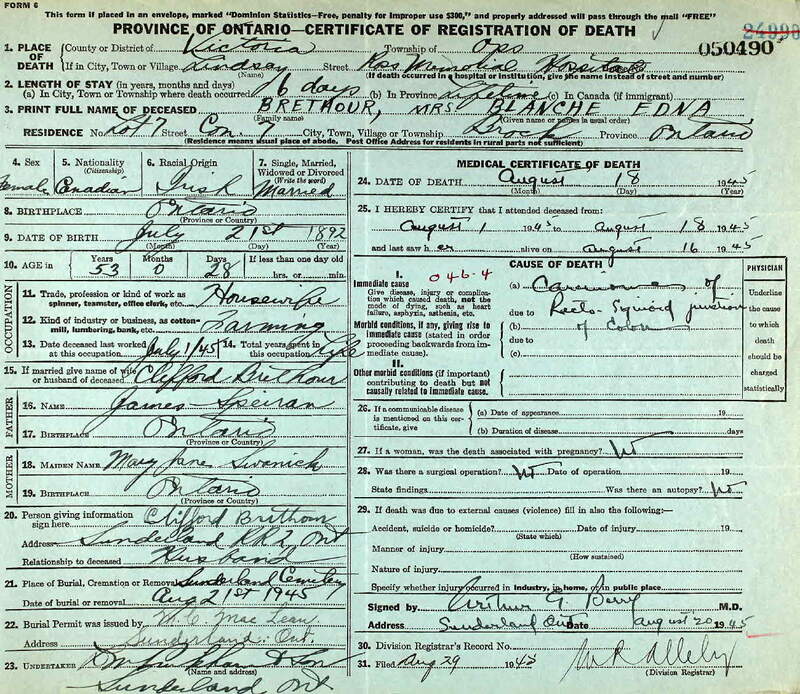 Birth* Mabel Beatrice Spearin was born on 18 July 1895 in Blanshard Twp., Perth County, Ontario, Canada. 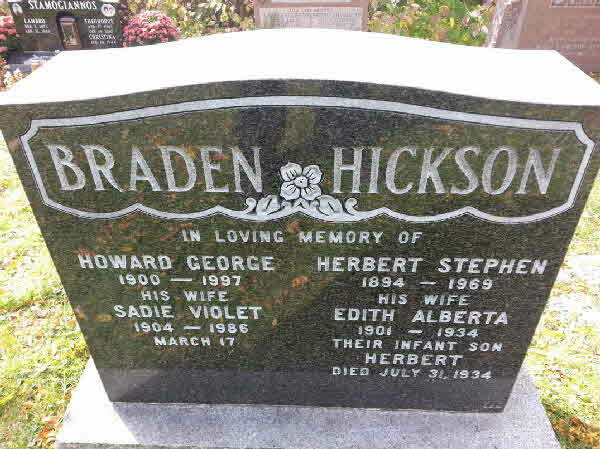 Burial* He was buried in St. Mary's Cemetery, Section N, St. Mary's, Perth County, Ontario, Canada. 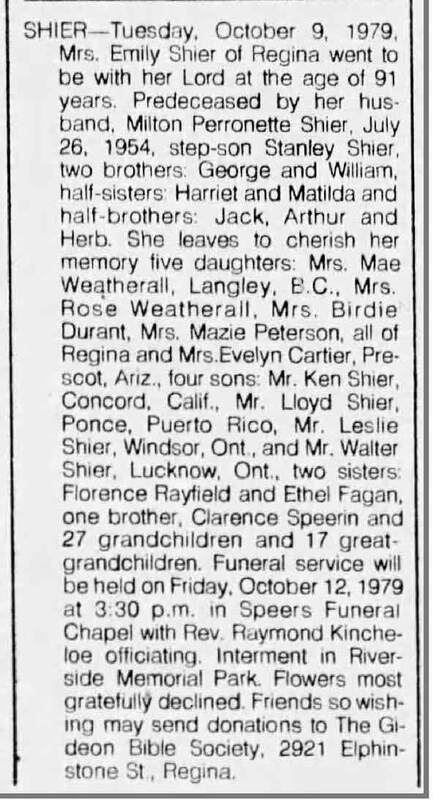 Death* She died on 9 October 1979 in Regina, Saskatchewan, Canada. 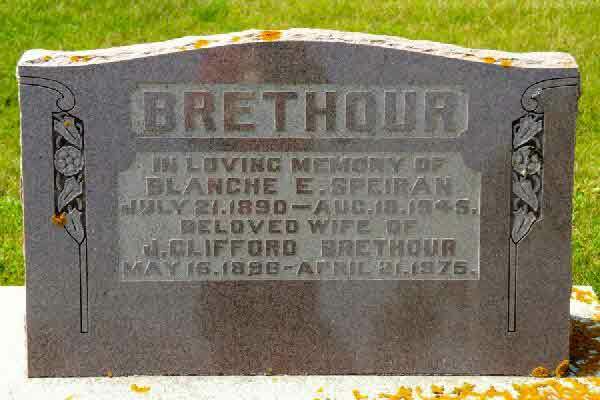 Marriage* Blanche Edna Speiran married James CLIFFORD Brethour on 30 November 1921 in Brock Twp., Ontario County, Ontario, Canada. 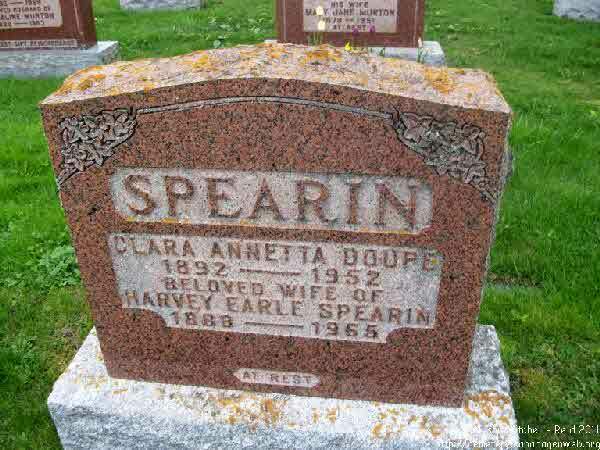 Death* Blanche Edna Speiran died on 18 August 1945 in Ops Twp., Victoria County, Ontario, Canada, at age 54. 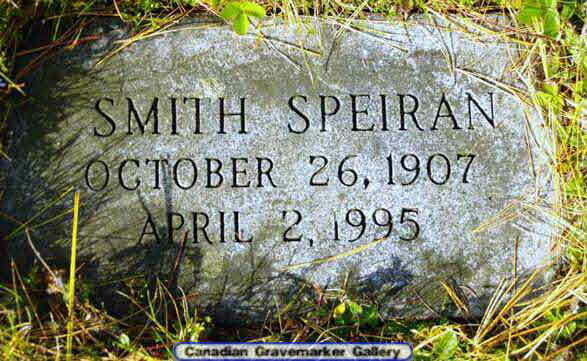 Birth* Carson Smith Speiran was born on 26 October 1907 in Mara Twp., Ontario County, Ontario, Canada. Death* Carson Smith Speiran died on 2 April 1995 at age 87. 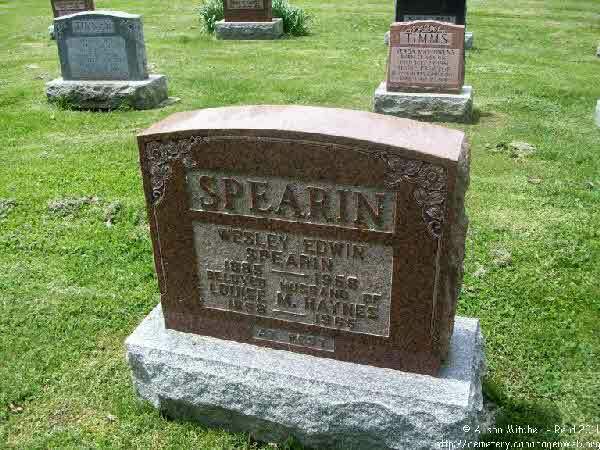 Birth* Edith Alberta Speiran was born on 18 December 1901 in Ontario County, Ontario, Canada. 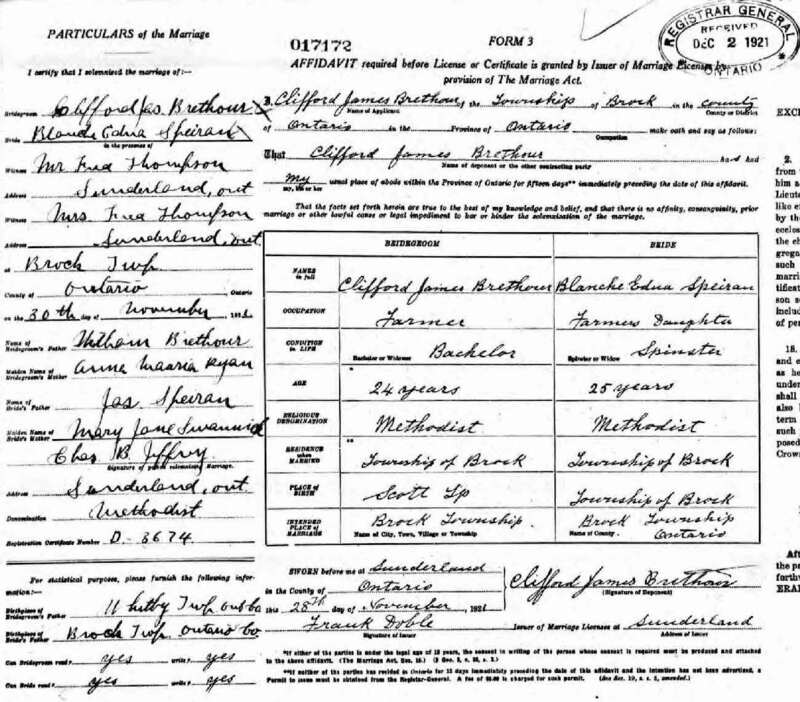 Marriage* Edith Alberta Speiran married Herbert Stephen William Hickson, son of George Hickson and Nellie Garroty, on 28 December 1926 in Toronto, York County, Ontario, Canada. Death* Edith Alberta Speiran died on 1 August 1934 in Toronto, York County, Ontario, Canada, at age 32. 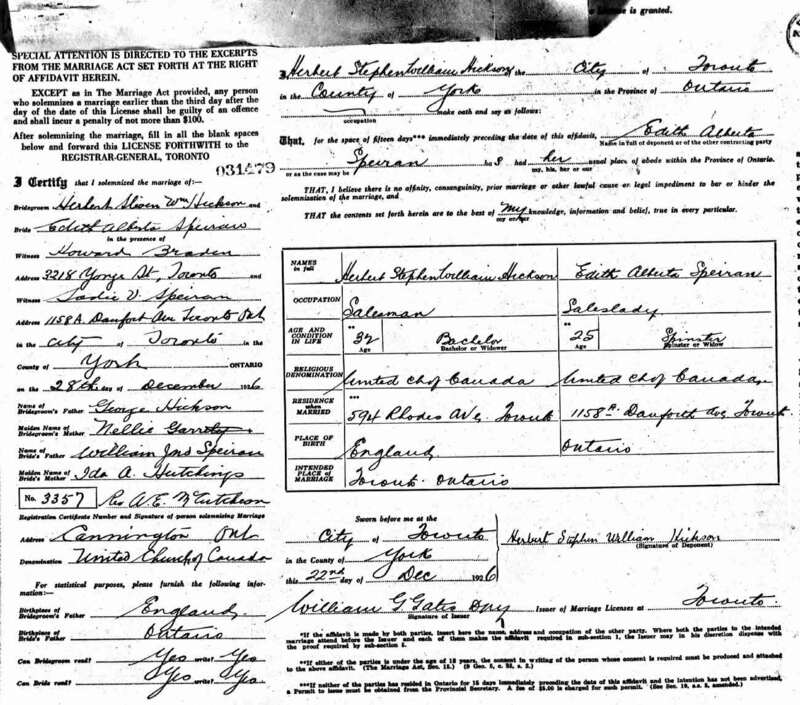 Marriage* Eugenia Gladys Speiran married Clarence Mustee on 14 February 1920 in Cuyahoga COunty, Ohio, United States. 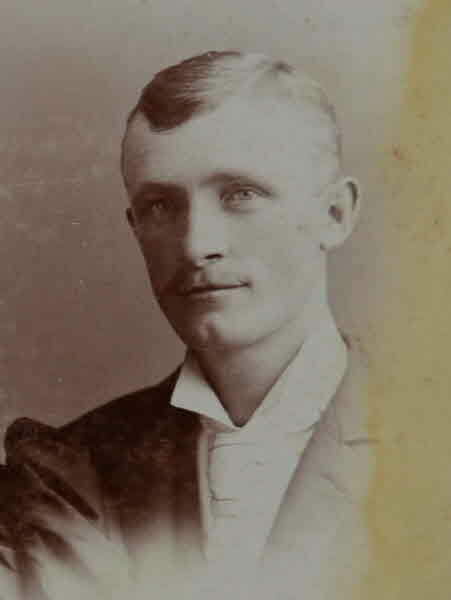 Marriage* George Speiran married Catherine Anne Smith on 3 February 1904. Marriage* He married Anne McLaughlin, daughter of Diana Acton, on 30 August 1869 in Ontario County, Ontario, Canada.